The Coen brothers have already established themselves as creative geniuses and their often quirky film work has produced such big screen hits like Fargo, The Big Lebowski, Raising Arizona, and O Brother, Where Art Thou. 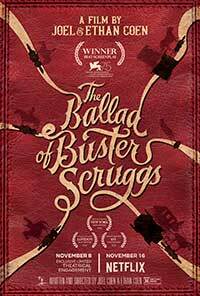 After a limited theatrical screening, their latest release, The Ballad of Buster Scruggs, now appears on Netflix. This six-episode anthology film springs to life from an illustrated collection of short stories, each of which opens with a color print and the first page of its text. The title story stars Tim Blake Nelson as Buster Scruggs, a good-natured gunslinger who dishes out cowboy songs and homespun commentary. Buster keeps his six-shooter busy as he readily dispatches his foes until his top-gun status receives a serious challenge from The Kid (Willie Watson). In Near Algodones, a would-be bank robber (James Franco) discovers that thieves and rustlers rarely escape the long arm of the law as Western justice is frequently meted out with a strong noose around the neck. 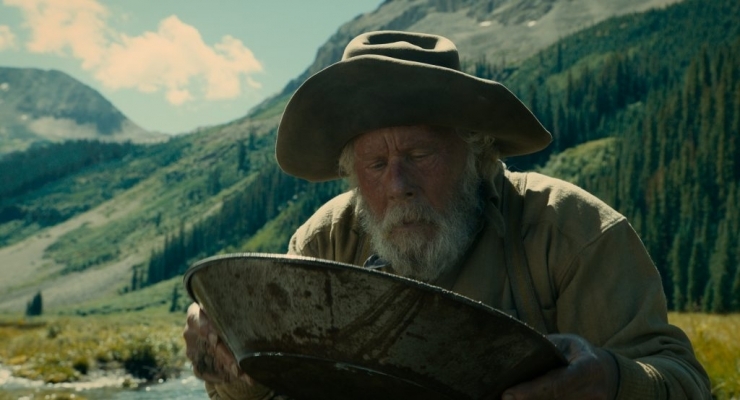 The lure of gold drives the tale of an aging prospector (Tom Waits), in All Gold Canyon, who finally digs up a gold-laden “pocket” only to have his life and newly-found fortune threatened by a young outlaw (Sam Dillon) who gets the drop on him. Meal Ticket provides a heart-wrenching account of a limbless young actor (Harry Melling) who is shamelessly exploited by the traveling stage show’s impresario (Liam Neeson) until a “barnyard genius” chicken comes along. Young Alice Longabaugh (Zoe Kazan) is The Gal Who Got Rattled and traveling on a wagon train bound for Oregon when her brother Gilbert (Jefferson Mays) dies leaving her penniless. Trail boss Billy Knapp (Bill Heck), tired of life on the road, offers marriage and financial security to Alice but the frontier can prove a merciless setting for lovers. In the final and literally darkest episode, The Mortal Remains, five disparate characters– heartless bounty hunters Thigpen (Jonjo O’Neill) and Clarence (Brendan Gleeson), gambler René (Saul Rubinek), holier-than-thou Mrs. Betjeman (Tyne Daly), and a crude fur trapper (Chelcie Ross)– take a late night ride in a stage-coach to what just might be their final destination. The Coen brothers’ The Ballad of Buster Scruggs pays stylistic homage to anthologies like the 1980s Creepshow films and there is aThe Hateful Eight vibe in its finale. What this talented duo of writer/directors does as well or better than most of their contemporaries is to bring their brand of dark humor and a cast of memorable characters to this collection of grim tales of the Old West. The Coens were also able to recruit some of the best actors in the business and gave each a role to literally and figuratively to die for(spoiler alert: someone does die in every chapter). Kudos go to cinematographer Bruno Delbonnel for providing scenic backdrops and to Carter Burwell for the fourteenth film score he has penned for the Coen brothers with its authentic sounding Western motifs. The Ballad of Buster Scruggs is an entertaining return trip to yesteryear’s life on the untamed frontier and will definitely capture and hold your attention for the next two hours. Highly recommended. The Coen brothers have given us their brilliant take on the Old West with six rather grim tales, interlaced with their typical dark humor, and blessed with great cinematography and authentic-sounding Western score.